Today we had a surprise appointment with audiology. Not sure when it was scheduled or by whom, but we got the reminder call and went. We met Scarlett's new primary audiologist and discussed the exact parameters of her hearing loss, as well as how to proceed with hearing aids. 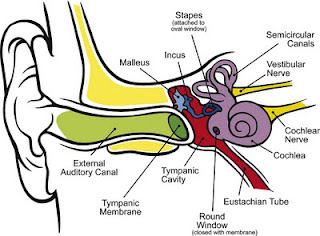 She explained in more detail the cause of the hearing loss, how it is measured and what changes we might expect. Basically, the chemo kills hair cells, including the cochlear hairs that conduct sound in the inner ear. Some hair grows back after chemo, but not quite the same; it is not likely that she will regain much hearing even now that the ototoxic chemo has been stopped. In addition, the shunt infection, similar to meningitis, as well as the antibiotics used to fight that infection, were likely damaging to other areas of the ear, so her hearing took a big hit in a short amount of time. 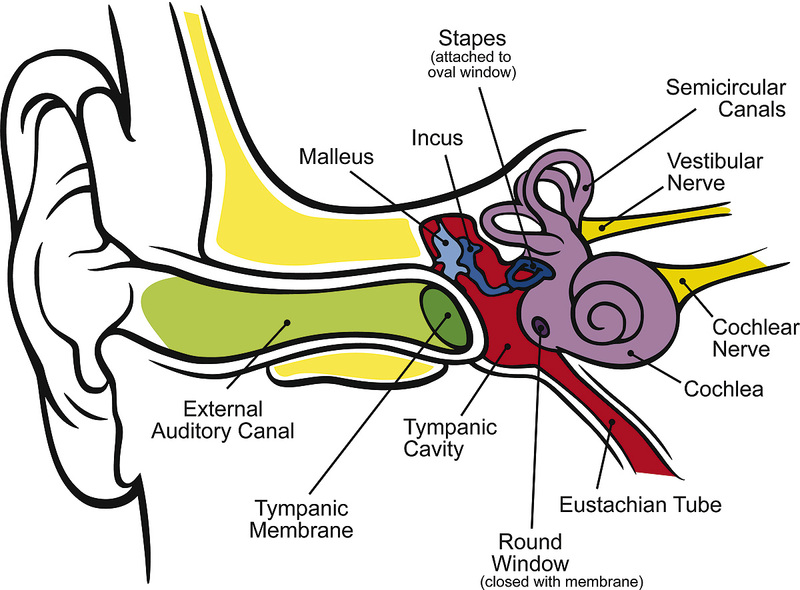 Scarlett's cochlea does not process sounds correctly due to ototoxic chemotherapy. She also has long-term damage from her shunt infection and high-dose antibiotics. Her hearing is categorized right now as mild to moderate on the right, more severe on the left. We got a graph to show what decibels and frequencies she is hearing and not hearing. She can hear most speech sounds at close range, especially when we hold her or are face to face. Those speech sounds fade and become difficult to understand around 6 feet away, or at lower volumes; this will make it very difficult for her to learn to speak properly without amplification. She likely hears loud noises fine - things like alarms, live musicians, horns, and even dog barks (which we know she hears, thanks to Cosmo). Subtler sounds, like television, phones, vacuums and normal speaking voices are harder to hear accurately. Quiet sounds, like birds, leaves and drippy faucets are probably inaudible for her right now. With hearing aids, she should be able to hear most all of these sounds, and with the support of speech therapy, should develop normal speech. She is not currently a candidate for a cochlear implant, but may be if her hearing loss progresses. We are looking into all the supportive services we can access for her. There are a variety of hearing loss support services locally, most of which offer intervention for babies as young as 6 months. We also need to take her for an ear, nose and throat evaluation just to be sure there are no other medical or anatomical reasons contributing to her hearing loss (a standard prerequisite), as well as a developmental assessment to see if any developmental challenges need to be addressed along with her hearing. It was a very informative, but overwhelming appointment. The cost of hearing aids is huge - anywhere from $1500 to $3000 per ear every few years, not including the inner ear molds and accessories. Most insurance plans don't cover hearing aids, but it seems our current plan does - whew! Hopefully we can get her situated with the hearing aids before we have any insurance changes. However, in the event our insurance is not covering them, there are multiple ways to help fill the gap, including loaner hearing aids from the audiology department, state support services and payment plans. Right now, her hearing feels like a huge undertaking, as she is at such a critical age for speech development (and if you saw the video from yesterday, she is already experimenting with her voice!) We are already looking into what the best strategies are to support her communication, and the audiologists are suggesting we look at sign language as a supportive communication tool. It will keep me busy for a while. I understand how hearing loss can be overwhelming but it really is so manageable with so much technology! My son has moderate hearing loss. Getting hearing aids as soon as possible is key. Just one suggestion we have learned: focus on what you want the outcome to be. If you want her to speak and learn to listen well, then focus on teaching the spoken language. If you want her to use ASL then learn it as soon as possible so you can provide her a complete language for her to learn from you. What you focus on and work on is what you get. I also suggest checking out the John Tracy clinic. They have a parent teaching program for free on the internet that might be helpful and help those long days in the hospital! Read to her as much as you can and talk more into her good ear until she can get aided. Good luck! With everything you have been through, this will be nothing! You may have mentioned this before, so I apologize if this is redundant, but does Scarlett qualify for Early Intervention? We have that in Massachusetts, I'm assuming there is something like that in California. Its for birth-age 3 children who qualify for services related to speech, physical therapy, occupational therapy and other areas. We just had my 10 mo old son evaluated, and part of that evaluation was a speech pathologist. Might be something to look into, I'm sure Scarlett would qualify! My son was born with a progressive hearing loss. He could hear at birth, and lost hearing over time. For him it was very quick. By 4 months old he was profoundly deaf, bilaterally. We started with hearing aids at 6 months old, they did not have any affect. At the age of 1.5, this December he got a cochlear implant on the right side. He is thriving now, turning to sounds, actually making noise, he recognizes words like baba and gets excited. It's the little things that count. Owen also has moderate cerebral palsy and a g-tube which makes things more difficult. I know not the same as what your going through, but there are definitely many times I have been reading and can understand what you are going through with surgeries, hospital stays, therapy, hearing tests, etc. We also sign at our house, not so much ASL, but more of conversational sign. Our ultimate goal is to get Owen communicating verbally since working with his hands is not always easy. We started watching a show called Signing Time when we found out he had a hearing loss at a month old. It is amazing. My the 2 YO daughter picked it up like it was nothing and signs almost better then me now at 4. They have a series, called Baby Signing Time, which is animated in a way little kids love, and teaches all of the ASL signs for common things babies interact with. Something to watch with Scarlett at home or in the hospital. Hi! I've been following your log from the BBC boards. I'm glad to see Scarlett doing so well. I know it is hard having a medically challenging baby. I wanted to drop you a quick e-mail with some ASL links and apps. I've been following your blog for some time now. May I suggest you check out the HIKE (hearing imparied kids endowment) Fund - http://www.thehikefund.org/. I was a member of an organization called Job's Daughters when I was a teenager and their official charity is the HIKE fund. Groups the world over hold fund raising hikes in order to help kids with hearing problems. When I saw your post I immediately thought that HIKE might be able to help. Sign launguage is awesome and worth everything to learn it even for hearing kids. Helps them communicate before they can speak. I agree, I have worked with special needs children and deaf children as well. Sign language is great for everyone to learn. it is easier for the young children and you can start now. My grandson learned a few basic signs to help him express himself before he knew any words. he still uses some of those signs even though he talks very well.